Calgary, Alberta (Jan 13, 2017)… Today’s Supreme Court of Canada (SCC) decision is an important one to regulators across the country. This was an important decision affecting the ability of regulators to carry out their responsibilities, which was evident in the participation of other provinces in the proceeding in support of the AER. Not one province attended the hearing in support of AER, not even Alberta. 2015-12-17 Correspondence received from…the Attorney General of Canada. They are discontinuing as interveners and will not file a factum or present oral arguments. The decision has validated the position held by the AER that the claims against the AER’s predecessor, the Energy Resources Conservation Board (ERCB), should be dismissed. The Court did not find there was a breach of Ms. Ernst’s Charter rights, and made no findings of negligence on the part of the AER or its predecessor the ERCB. Ernst still has a valid Charter claim against the AER, the courts just ruled she can’t seek remedy even though the Charter guarantees remedy. The Supreme Court ruled that Ernst’s only remedy for the AER breaching her Charter rights was to seek judicial review which Ernst was not permitted to seek at the time the AER breached her rights. Legal Catch 22. 2017 01 19: Alberta Energy Regulator’s Response to Ernst Case ‘Inaccurate and Misleading’, Say Professors Agency misrepresents Supreme Court ruling on right to sue over alleged Charter violations, they say. The Court recognized that permitting the claim would hinder the AER’s ability to carry out its statutory duties effectively and in the public interest. The AER appreciates that the courts at all levels took the time to carefully consider this important matter and in each instance issued clear, well-reasoned decisions. The ruling was a 3-way split: 4/1/4. The Alberta Energy Regulator ensures the safe, efficient, orderly, and environmentally responsible development of hydrocarbon resources over their entire life cycle. 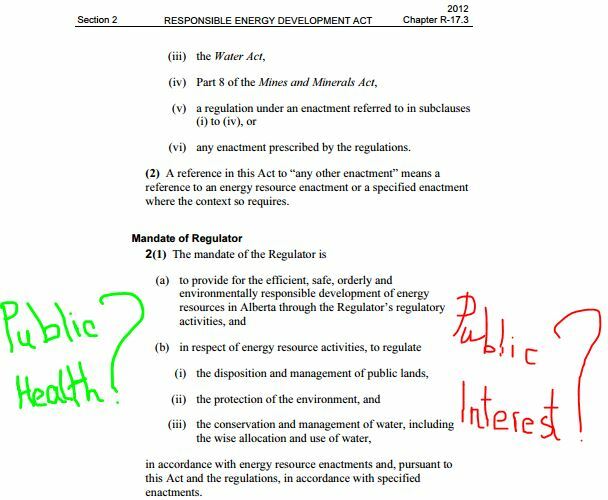 AER has no public health or public interest mandate. Refer above to REDA Reality Check. AER engaged in fraud covering-up Encana breaking the law and fracturing Rosebud’s drinking water aquifers and contaminating them. In Ernst’s direct experiences, AER is a malicious bully towards the harmed citizen every time she presented documented evidence of Encana non-compliances. This includes allocating and conserving water resources, managing public lands, and protecting the environment while providing economic benefits for all Albertans. Ernst is an Albertan but is receiving economic losses from the AER’s gross negligence and acts in bad faith covering-up Encana’s illegal Rosebud aquifer frac’ing and AER violating Ernst’s Charter rights trying to intimidate her silent, and punish her for providing evidence of Encana’s non-compliances and publicly exposing the AER for the fraud that it is. It is always open to the Supreme Court to reach a conclusion on a question of constitutional interpretation even if it differs from the position advanced by the parties. For reasons set out below, in my view, the premise the Court accepts in Ernst, that a statutory immunity clause can bar a Charter claim, is flawed. The search for remedies that are “just and appropriate” under s.24 of the Charter is fundamentally distinct from the search for a duty of care and breach under the common law tort of negligence. While I think the dissenting Justices come to the right conclusion, their reasoning is also based on a faulty premise. By suggesting that the merits of the Charter damages have to be assessed before considering the scope of the statutory immunity clause, the dissenting Justices, like the majority, seem to put the statutory cart before the constitutional horse. The case is not about whether the Charter was breached, or, if so, whether Charter damages are appropriate—rather, this case is about whether a claimant should have a chance to prove her allegations of a Charter breach warranting damages as a remedy, and whether a statute can bar her from having such an opportunity.